Investment was driven largely by a surge in the mining sector, prompted by higher world energy prices. Gross Domestic Product (GDP) grew at a 4.1 percent annual rate in the second quarter, the strongest pace since a 4.9 percent rate in the third quarter of 2014. (Growth had been 5.1 percent in the second quarter.) By far the largest contributor to this growth was a 4.0 percent rate of increase in consumption spending. This was a bounce back from the first quarter when growth was just 0.5 percent. Durable goods consumption was the biggest part of this story with spending rising at a 9.3 percent annual rate. Nonresidential investment grew at a healthy 7.3 percent annual rate. 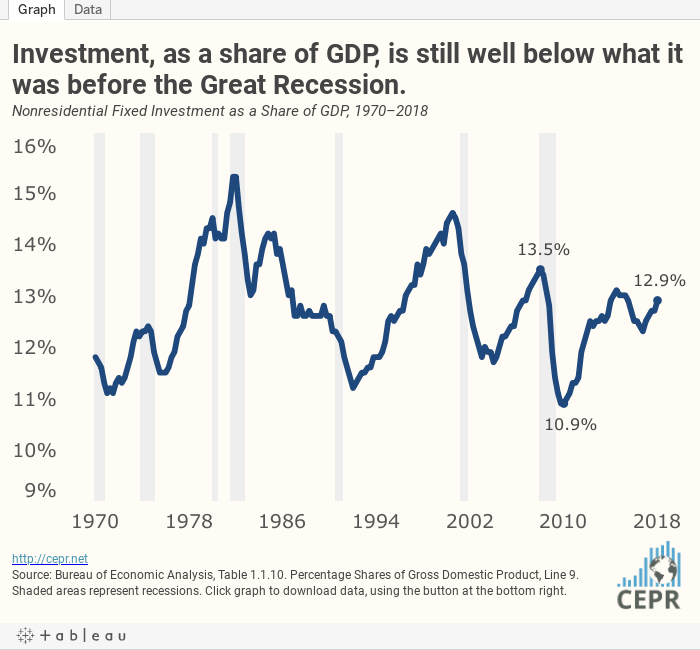 This brought the investment share of GDP to 13.6 percent, although it is still below the prior peak in the recovery of 13.7 percent in 2014, and far below the levels hit in the 1990s boom or at the end of the 1970s and into the 1980s. The largest contributor to this growth was structure investment, which rose at a 13.3 percent rate after rising at a 13.9 percent rate in the first quarter. By contrast, equipment investment rose at just a 3.9 percent rate. Given the shorter lead time in getting equipment investment in place, this would be the more plausible place to look for an impact from the tax cut. The structure investment was driven overwhelmingly by a surge in mining-related construction, which increased at a 97.1 percent annual rate after rising at a 31.0 percent rate in the first quarter. Spending in this area is overwhelming driven by world energy prices. For example, it rose at 84.5 percent and 65.9 percent annual rates in the first and second quarters of 2010 as energy prices jumped back from recession lows. Residential investment fell by 1.1 percent following a 3.4 percent decline in the first quarter. This is likely a response to the higher mortgage rates in the last year. Mortgage rates are now close to a full percentage point higher than their levels of two years ago. Given the importance of housing costs in people’s budgets and the large contribution of rent to inflation, the weakening of construction cannot be viewed as good news. Inventories fell at a $27.9 billion annual rate, subtracting 1.0 percentage point from growth. This decline will almost certainly be reversed in future quarters, providing a substantial boost to the GDP figures for the second half of the year. On the flip side, a sharp reduction in the size of the trade deficit in the quarter added 1.06 percentage points to growth. This is likely due to the “stocking up” effect as foreign purchasers sought to buy large amounts of items like soy beans before their governments imposed retaliatory tariffs. This is also likely to be reversed in future quarters as purchases fall below normal levels. The comprehensive revisions that were incorporated in this report showed investment to be somewhat stronger than previously reported. The revisions also showed somewhat higher personal income, which translated into substantially higher personal savings rates. For example, the savings rate for the first quarter of 2018 is now reported as 7.2 percent. It previously had been reported at 3.4 percent. While the pre-revision savings rates were quite low by historical standards, and possibly unsustainably low, the rates now reported are close to long period averages. Another notable change was a downward revision to profits in recent years, with corporate profits for 2017 being revised down by 3.0 percent. This may indicate that workers are starting to retake part of the national income share lost during the recession. There continues to be no evidence of accelerating inflation in the data. The core personal consumption expenditure price index has risen by 1.9 percent over the last year, still below the 2.0 percent average inflation rate targeted by the Federal Reserve. On the whole, this is clearly a positive report. It was boosted by some one-time factors, most notably the jump in exports and the bounce back in consumption, which will not be repeated in future quarters. On the other hand, the drag from inventories will be reversed and provide a lift in the second half of 2018. While growth is not likely to remain above 4.0 percent, it could end up close to 3.0 percent in the second half of 2018, leading to a growth rate above 3.0 percent for the full year.